Handling treadmill repairs throughout the Maryland and Washington DC metro areas. We schedule all treadmill repairs through appointment, at your location whether you are a home owner needeing a treadmill belt replaced in Baltimore, a jail in need of treadmill motor repair in northern Virginia or a municipality wanting to upgrade your treadmill consoles in Washington DC. We stock a full line of treadmill parts and fitness equipment parts: These include Life Fitness Treadmill belts, Sportsart Treadmill parts, and even other finess equipment such as Life Fitness Elliptical parts, and Stairmaster Stepper and Stepmill repair parts. Atlantic Fitness can also repair your home brands such as Pro Form Treadmills or Body Solid Treadmills and has availability to all their full line of parts and treadmill belts. 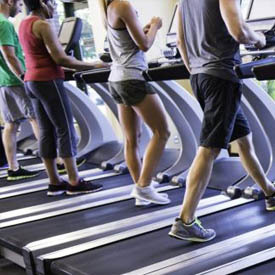 Some of our fitness repair services include treadmill adjustment, treadmill belt replacement, Treadmill motor repair, elliptical repair, and fitness console replacement. We are certified through Stairmaster and Schwinn Fitness.